Uh-oh! Wu-Feng, the Lord of the Nine Hells, knows where to find the funeral urn that contains his ashes and he’s sending his demonic minions to retrieve them. 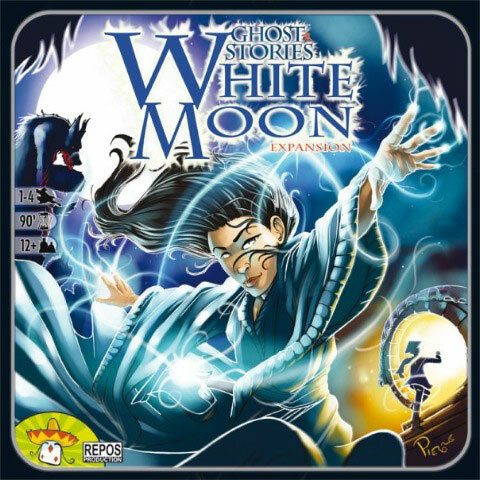 It’s your job as a Taoist priest, armed with your own unique ability, to defend the village from Wu-Feng’s army of shadows but you’ll have to use teamwork to rid the world of these malevolent ghosts. We’ll get back to the haunting after a while, but first, we have to exorcise the game’s technical details. Players select their priests (red, yellow, blue, and green) and everyone starts in the village’s center. The eldest priest at the table (the oldest player) takes their turn first. Before each priest’s turn, the player brings a ghost (from the ghost draw pile) into play and places it on a free spot. (There can be actions and/or abilities that bring more than one ghost in play per turn.) Every priest has their side of the board (color-coded to their priest) and can accept up to three ghost cards. Each ghost has its own color (just like the priest), and they get placed on the priest’s area who matches their color, if possible. If there’s no space available in that priest’s area, the player bringing the ghost into play puts the ghost on any other priest’s area who has space available. If it’s your turn and you have no space available to accept a new ghost, you take one point of damage instead of placing a new ghost. We’ll talk more about ghosts and get to player areas in a bit too, but let’s finish with what happens on a player’s turn. On their turn, a priest can move once to any adjacent space on the board and gets one action. The priest has two options for an action. They can choose to exorcise a ghost (located next to the priest’s space) or claim the ability granted by the villager on their space. There are a lot of villager abilities, so I won’t discuss them at length here, but you can do things like place a Buddha statue that will automatically kill a ghost entering a priest’s area or resurrect a fallen priest from the underworld’s embrace. But usually, you’ll choose to exorcise a ghost by rolling three dice with different colored circles on each side. 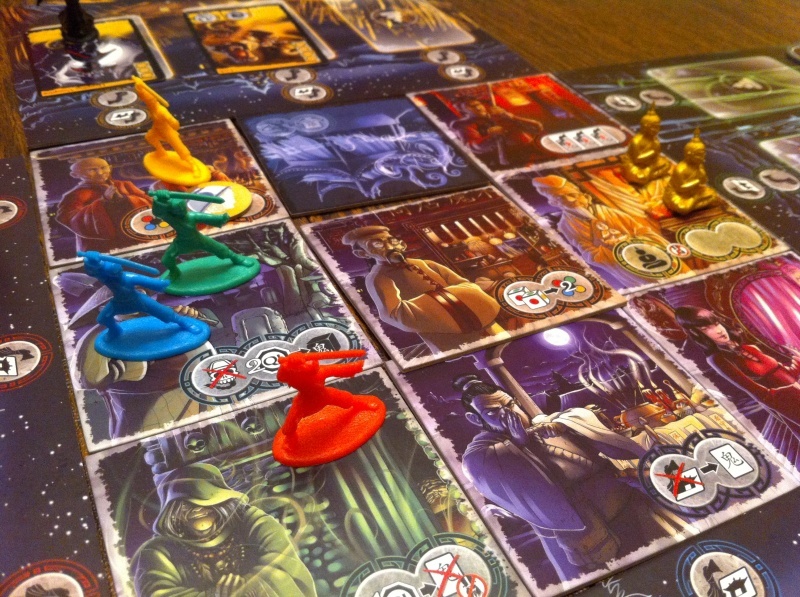 You have to roll a certain number of a particular color to defeat a ghost and you can add color tokens—that you’ll gain through abilities—to your roll. Once a priest has taken their move and action for their turn, play passes to the priest on their left. Here’s the red priest’s play area. The glowing spaces in the shape of cards are where you can place a ghost card. The circles above the card spaces are where you place ghost pawns and denote how close a ghost is from haunting a village space. 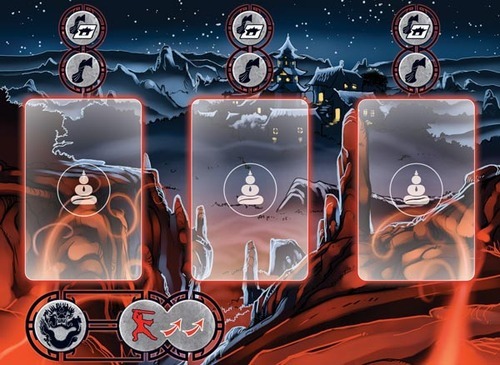 The space in the bottom left-hand corner of each priest’s play area holds a dragon space for your yin-yang token, which allows you to exorcise a haunted village space, and to the right of that has a graphic representation of the priest’s special power. The red priest doesn’t just move one space (as you could guess from his ability icon above), he flies to any movable location on the board. The blue priest moves normally but gets two actions; these actions have to be the same, so no using a villager ability and then exorcising. The green priest doesn’t ever have to roll the curse die (a die that shows up at times that doesn’t have a good outcome) and gets an extra exorcism die, while the yellow priest collects one free color token at the beginning of their turn. Here’s Dark Wraith for an example of a ghost card. The icons in the top, left-hand corner tell you what you need to beat him. You either need to roll three black circles on three dice or hand in some black tokens to supplement your roll. I’m thinking you’re going to turn in at least one token. 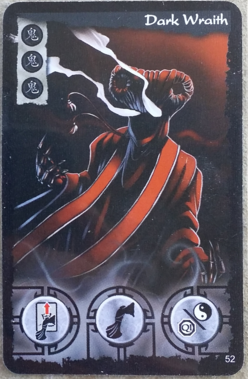 The three icons on the bottom of the card show Dark Wraith’s abilities. The icon on the far left happens when Dark Wrath comes into play. With this particular icon, you draw another ghost card and any ghost pawns on the board move forward one in their areas. The icon in the middle triggers before each priest’s turn who has the ghost in their area. In this case, Dark Wraith spawns a ghost pawn on his space on the turn he’s played and then moves farther down the track in his area each subsequent turn until he haunts a village space or gets exorcised. Come on, priests. Do your stuff. The icon on the far right happens when you defeat Dark Wraith. This particular icon allows you to gain one Qi (health token) or replenishes your yin-yang token—everybody gets one. If there are ever three haunted village spaces, you lose. You lose the game in three ways: three haunted village spaces, all priests are dead at the same time, and you don’t beat Wu-Feng in time. Remember Wu-Feng, the big, bad ugly from the introduction? Yeah, he’s placed ten cards from the bottom of the ghost draw deck and you have to defeat him before all the cards in the draw deck are gone. Good luck with that. 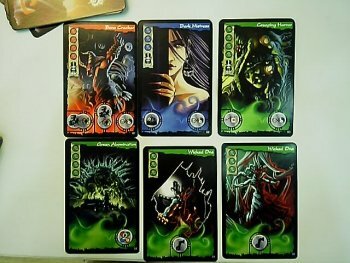 You win the game if you survive the ghost deck—and I do mean survive—and defeat Wu-Feng before time runs out. Ghost Stories is fun but brutal. I enjoyed the first five or six plays until I realized that I didn’t get any closer to defeating Wu-Feng. Most of the time, I didn’t even see Wu-Feng. It says something when your gaming group starts betting to see how long you’ll last instead of whether or not you’ll win. Still, Antoine Bauza gave this game rock solid mechanics, the art is gorgeous and thematic but creepy, and you feel the anxiety of this pressure cooker. I like this game a lot but it’s a bit misleading on a couple of accounts. It has a spooky vibe to it but it’s not scary. When you think Ghost Stories, you expect something to frighten you but your monks are so strong that you can’t possibly be scared. The title is a misnomer for another reason. You’re playing the same story several times. Shouldn’t it be called Ghost Story? The expansions build on this story and could add more options, so I guess that’s where the plural “stories” comes from but not all expansions are created equal. 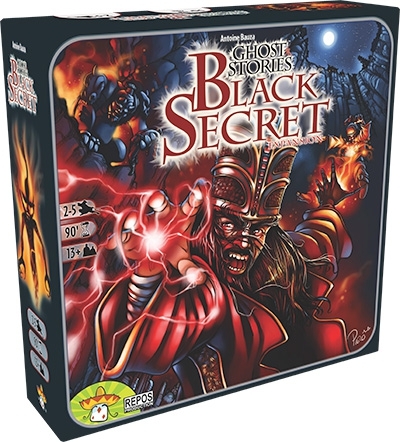 The Black Secret expansion makes the game more difficult—like it needs to be more difficult—while the White Moon expansion makes Ghost Stories easier. I’m all for easier. Give me the max number of Qi (health) and I’ll still lose. You get five Qi on easy, four on normal difficulty, and only three Qi on hard mode. Hard mode? Are you crazy? I guess if you only want to play for five or ten minutes, you can play on hard mode. See you at your funeral. 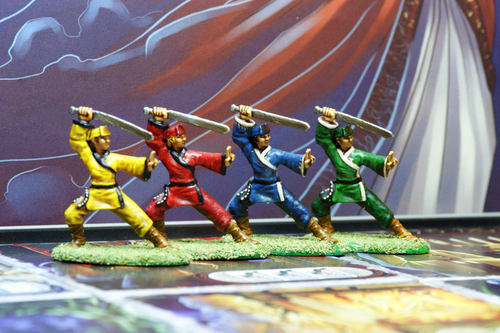 Cooperative games have the lion’s share of the tabletop industry. They’re easy to teach and get into because everyone’s working together. You want to help the newbie play well. You also take out the sting of losing; if I lose, we all lose. 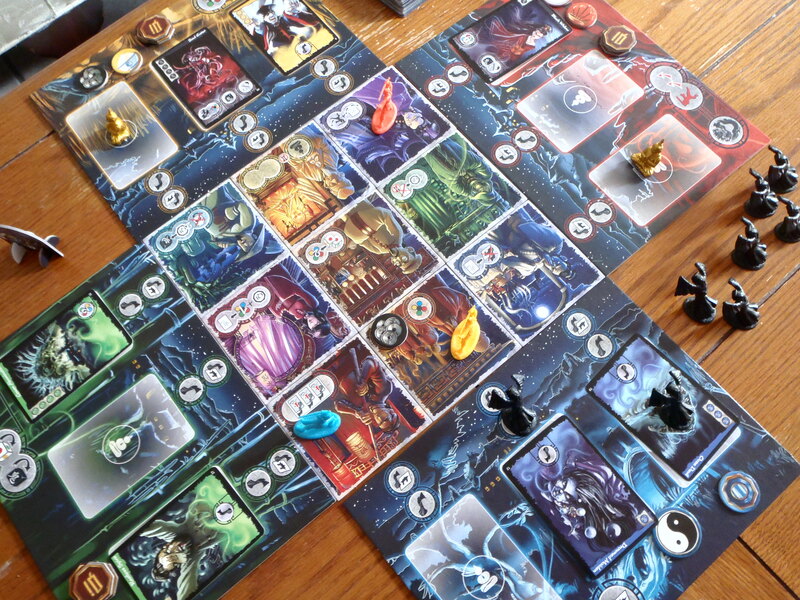 Ghost Stories captures most of what makes a co-op game fun. I just wish it was a little more forgiving.